Pure chocolate by Jinji was founded in 2012 by Jinji Fraser, and her father, Guy. Since the beginning, the priority has been maintaining a high level of sensitivity to the farmers who grow & harvest the cacao, and to the earth that yields the fruits. Along with local, seasonally selected ingredients, the chocolates also pay tribute to the ancient art of storytelling, creating rich flavor profiles that are both complex and memorable. In order to preserve the integrity of the chocolates, they are each handcrafted, and free from dairy, gluten and all refined sugars. Today, you can find a full selection of Jinji chocolates at their retail shop at Belvedere Square Market, to include pralines, barks, fudges, truffles and many more novelty creations. Jinji chocolates are also available in limited supply at area restaurants, grocers and cafes. Look mom, your pecans! And our chocolate. #thankyou #cacaolife #baltimore #bsq @citypaper y'all are super dope! "I'm a storyteller with the very good fortune of using raw cacao as my medium. We practice daily, the suspension of judgment & expectation so that the power of the story can be delivered. Sights, sounds, touch, scent and taste all become my muse, giving flight to a very spirited chocolate journey." 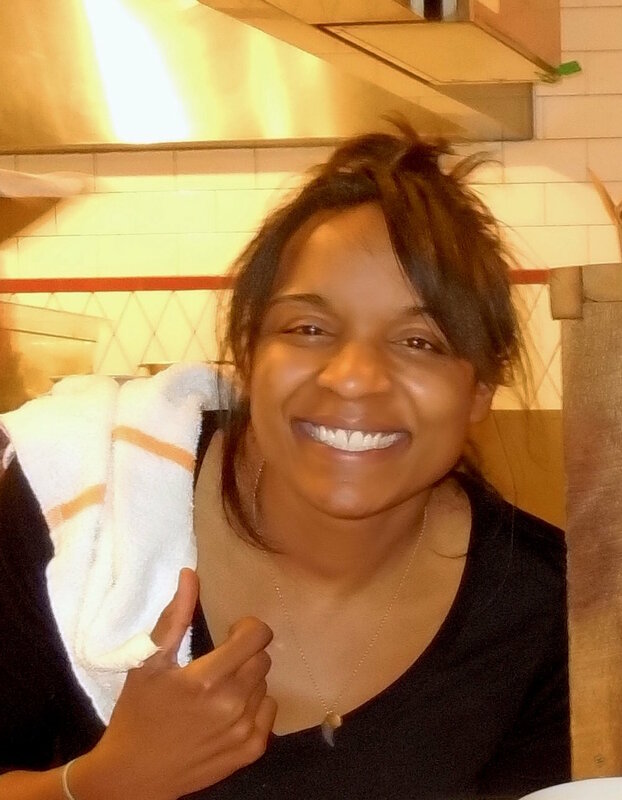 "My most exciting time at the shop is welcoming new customers. They usually come with high expectations to see if their experience with our chocolate reflects what they've read and heard. So many of them have become our veteran chocolate lovers." "Making chocolate is not only a creative outlet, but an emotional one as well. The shop is my safe harbor, the chocolate is my reflection and for those who experience what I make, they are my witness." Each chocolate we create tells a story. We begin by focusing on a specific memory, an event or an emotion and we work with that moment until we can taste it. Then, the crafting of our next piece of chocolate starts. We select the purest ingredients we can find to tell our stories, working with local farmers when we can, to transport you to the place we began. In doing so, a community is created amongst us, where through these flavor profiles we understand one another's personal experiences and collective visions. Think about what it means for you to face the world you live in each day. What does it take for you to get up and brave the elements you are sure to face as the sun rises, then sets once again? It’s a different picture for everyone reading this. For some, the alarm sounds hours before their responsibilities are due to start. Preparation for the day means feeling a few miles move under their feet, a dedication to the self in order to feel strong enough to tackle what’s to come. For others, responsibilities are what literally yank them out of bed and get them moving. For those individuals, strength might be found in sips of coffee taken during short moments in between helping a little one find a missing shoe and making sure the others have lunches and homework assignments in tote as they head out the door. For yet another, the coffee that aids his neighbor is instead nips from a flask - a constant companion to be relied on throughout the day when a little extra punch is needed to get by. Though different, the practices and self-prescriptions that we rely on all serve the same purpose. In them somehow, even those that are unhealthy, a sense of strength and even courage is found. We do. We must. But why? Behind the war paint is what we are protecting. We try to hide our vulnerability in order to guard what is innocent and what is treasured. For those kneeling in solidarity, I don’t know what serves as your war paint, but you do look brave. You do look strong. I admire you for protecting what is most precious in your world. Flavor Notes: Opening with tobacco and coffee, moving through red wine, which is carried by jasmine flowers | garnished with warpainted marshmallow. When I first learned about the Civil War I was a kid, I couldn’t grasp everything that it was made up of. I couldn’t begin to understand the profound malice that allowed one person to enslave another. It’s still hard for me to accept that people are capable of such inhumanity. I vividly remember my teacher explaining not only was the country drastically divided over the issue of slavery, but some households were too. Some brothers turned on each other and found themselves on different sides of the battlefield. While the big picture of the Civil War was too abstract for me to understand at that time, having a brother made this aspect relatable. Even though my brother and I never got along all that well, I couldn’t imagine being so different from him that we would find ourselves on opposite sides of a war. I knew myself and I believed that my family was loving. I considered us “good guys” who could never be so hateful. I thought we, collectively as a unit, were honorable. Small differences aside, we could never be divided when it came to something so blatantly obvious as the importance of being respectful and loving towards others. Sadly, I grew up to learn that I was wrong. My brother now lives in Charlottesville, VA. He moved there because of the open carry laws. We don’t speak, and haven’t in year because our political views passionately clash. I don’t know if he was involved in the riot on 8/12/17, but I can’t say for certain that he wasn’t. And if he was, he wasn’t on my side. Afterall, we are that house divided. “Guntotinpatriot,” as you call yourself, my Charlottesville story is about you. What must it feel like, the sun pressing into your face, just narrowly slipping past the brim of your sunhat - no other shade anywhere, not for miles. We're women in the rice paddies of rural China. We've just given birth while working in the paddies, less than an hour ago, now back to work with our newborn strapped to our back. We are strong. This is our choice and rite. We are doing the work our great, great grandmothers did, continuing the legacy for she, who is now observing the life she's been born into. A life whose reward is in the living itself, filled with community and constant work. There are men in the paddies too, but do they feel the wet earth collecting around their feet, cradling them, as they cradle their own? Can they imagine the solace found in the watery wisps of tall grass brushing their legs, whispering songs of grace. The women can. Every body works the paddies, but the experience, even beyond the work belongs to the women. We created this chocolate with delicacy in mind - both in flavor qualities and presentation, there is a constant awareness of the role some spices have in bringing out others, and the unimposing role the textures play. Losing love is a formative experience. The heartbreak that occurs when what is cherished most is taken away, changes people. It's a devastating change. It destroys what was planned and leaves uncertainty and fear. For most, when faced with this kind of change, we adapt. We let the pain in, we experience what it feels like, and, after we've spent some time with it, we begin to let it go. As we release this pain, the change that we were initially so afraid of starts to look different. We start to see it as opportunity. We feel hopeful, and loss becomes a point in time from which we hike forward. However, for some, heartbreak changes them in a different way. Instead of loss becoming a moment, it becomes a place. A dwelling in which to sit and stay. Stuck. Moving forward and away from this place is too risky. Learning to love again seems too hard. So, walls are built. And they grow, reaching deep into the earth and stretching tall into the sky. They are meant to protect, but eventually they imprison. It's said that love with another is one of the greatest illusions in the human experience. We feel the first rush of dopamine (the love drug) rushing through our veins and we're hooked. We're convinced these feelings of absoluteness and euphoria are defining our very beings. So, we cling to this other. We mold this other. We do all we can to keep this other, until our grasp becomes weakened by the very control we thought strengthened us. And then, we realize, all along, we've been mesmerized by a ghost. We have always known in the quiet (non-drugged) space in our soul, that what's real is only us, but we also know it will take quite a journey to get back to that truth. But we try anyway, because we must. Because even as the ghosts of love lost and love passed haunt us along the way, the hike back to ourselves is indeed the most (the only) essential work of our lifetime. Walking into the depths of the earth, ever darker, ever darker. Flying into the infinitum of the sky, ever higher, ever higher. Traversing the vast divide, ever further, ever further. Our ears congest and sounds slowly mute. The hollowness that surrounds us, tucking into every opening and crevice is incromprehensible—it’s too big, it’s too much. The weight of the many shadows around us is eerily heavy, as if it were the golden hour, but instead it’s black. We become still, because in blackness, we know the only shadow should be our own. But there is a new truth in these many shadows, one that we can only see now that we feel nothing else. One that hid perfectly in broad daylight, but now cradles us in the void. One that masqueraded as familiar and transparent, and now in a state of sensory deprivation, it’s exposed and hostile. At the shop, we experience cataclysmic conditions with a sense of urgency toward creation. We choose to believe that by embracing the absolute darkness of a situation, and experiencing it on the most intimate levels available to us, we can translate our reactions into a level of light that cannot be ignored. Monsters live among us. We don't always see them, but even as the sun is shining, they are lurking; Only allowing themselves to be seen when they want to be. As we age, they change. They crawl out from underneath our childhood beds to find new dwelling places in our adult lives. We are vulnerable in this world and they know it. It was a cool morning, but the sun was warm on my skin. I felt safe and strong, so I ventured a little further into the woods than I normally do. I was happy. Confident. Then! Suddenly, I felt altogether uneasy. Upset. I was brought to the ground in pain from a wound I hadn't yet identified. Injured and in danger, I lay still. Jaw clenched, eyes shut, and breath held, I silently begged the monster to move on without causing any more destruction. "Please, leave me to heal". Breckenridge, Colorado: Ever closer inching toward 14,000 feet along the continental divide, scrambling over loose rock--some as small as pebbles, others seem like boulders--trying to keep footing, step by step through the early Fall snow and ice. The air, which waegegs at the start crisp, cool and refreshing has become sharp, thin and unforgiving. In the distance smoke billows from controlled flames, and suddenly, the earth blends with the sky, and the sky becomes the earth. The point of horizon disappears and we realize we are standing in the midst of majesty. 72% dark chocolate enrobed with a pineapple and yuzu ganache. Pineapple garnish. 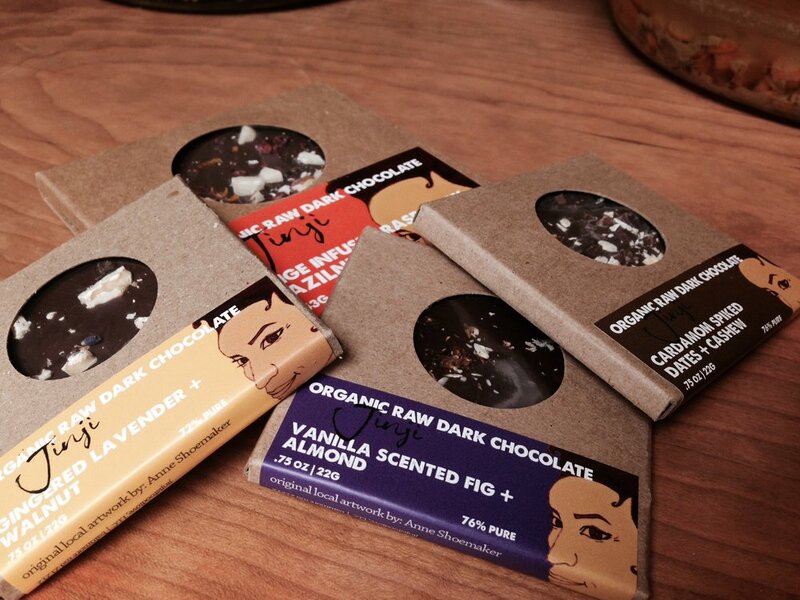 Interested in carrying Pure Chocolate by Jinji at your location? We believe in supporting businesses that care about the environment, are socially responsible and are run by cool people. We like to think that's the way we operate too! Please contact us to discuss any opportunities you have in mind. In order to protect our chocolates from mishandling and temperature fluctuations, we do not ship at this time. However, between our coolest months, November through April, we will make case by case exceptions. For more information, visit us at the shop or fill out the form below! We will get back to you soon.